We recently had our first Mommy and Me Crafternoon! To kick things off we decided to dive into tape, textures, and tracing for participants to create one-of-a-kind artworks to take home. Not to mention, this project super fun and easy! We used both conventional and unconventional materials to help spark the kids’ and parents’ imaginations. When focusing on the materials and how we use them rather than the end product, we engage in a type of artmaking called process art. Process art focuses on the actual experience of creating the artwork rather than the final product. There is no specific example to follow and there are no true rules to follow while creating the art. Engaging in process art should be a relaxing and calming experience where the child is making decisions about how to use the materials so that the finished product is completely their own. This is easily done by focusing on the materials, tools, techniques and identification of the elements and principles of design while working together. Talk about the shapes and marks the child is making. Comments like “I see you colored in that circle red” or “I see you created a beautiful pattern by using the Q-tip to make polkadots” are identifying the child’s artistic choice and showing them that you recognize they made an independent decision about their artwork that resulted in something you are interested in and care about. By using stencils we get to practice naming and identifying shapes while strengthening fine motor skills and spacial relationships. Pastels are a fun choice to illustrate that by using your fingers as a tool we can blend colors and create different intensities of color. We also get to focus on the textural and aesthetic differences between oil pastels and chalk pastels. Stamps are a perfect introduction to printmaking and patterns. By having to re-ink the stamps there is also a clear sense of cause and effect established by seeing the image change with different amounts of pressure and colored ink. Here are the steps to creating your own one of a kind artwork that explores tape, textures, and tracing through process art! Have your child pick a stencil and if needed, help them trace it onto the drawing paper with a marker. Cover the page with the same shapes over and over or include some new ones. Overlapping shapes is encouraged! Remember, there are no rules to this, so as long as the child is enjoying making the shapes, they can fill up their page as much as they want. If they only want to make a few shapes, no problem. After picking out stamps, show your child how to ink the stamp. Together, push the stamp down on the pad and look check to make sure each line is covered in ink. Then, stamp your images into or around your shapes. It’s time to get your hands colorful! 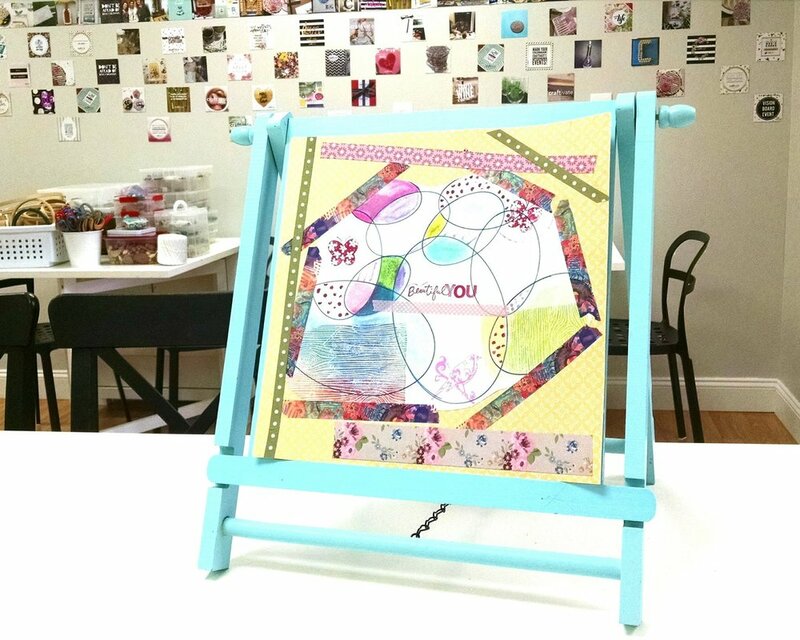 Choose a an oil pastel to color in the shapes and the stamps. Show your child how the color changes if you press down hard on the paper or if you use your fingers to spread out the pastel and blend colors. Have them experiment with both the oil pastels and the chalk pastels. Next, take out your Q-tips and explain to your child how Q-tips are considered an unconventional material. This means that Q-tips are not normally meant for art making but you can still use them to create art. Q-tips can be used with the ink pads to make polkadots inside the shapes or to make other patterns in the pastels. Ask your child what other materials might be fun to experiment with. If they mention something you have on hand, see if you can incorporate it into the project. When your child is happy with the design on the drawing paper, use scissors to cut it out around the edges so that it is smaller than your scrapbook paper. If your child is not ready to use scissors, show them how they can tear the edges instead of cutting to create a textured edge around their design. Once your design is cut out, choose a scrapbook paper that catches your eye and paste your design to it. Your design can be centered or off to the side for a more eye-catching composition. Explain to your child that the original design becomes the foreground while the scrapbook paper becomes the background. Now it’s time to put the finishing touches on your work of art: washi tape. Choose whatever colorful, patterned, pretty, silly tape design you like and add it to the corners of your design. It is nice to use washi tape to create a frame around the artwork or add interest to the overall composition. Children can easily rip the pieces of washi tape off the roll using their hands. Build confidence and strengthen fine motor and writing skills by having your child use letter stencils to add their name to their artwork. Taking ownership of what has been created by adding their name helps to build confidence and pride as they develop as artists. Explain how all artists sign their name to their work to show the world that it is theirs. If your child is too young to trace the letters, have them make a fingerprint or handprint using an ink pad to mark their artwork. It will also serve as a meaningful keepsake down the road when those little hands aren’t so little anymore. Now you’re readying to proudly display your Tape, Texture, and Tracing treasure! Let us know if you try this at home. We love to hear about your experiences making process art with your children! Take some pictures while you work and share them with us! We can’t wait to create more cool crafts during our Mommy and Me Crafternoons!